What do you think of this Revolver Shaped Screwdriver? Probably the coolest way to fix a cabinet or anything else around the house. Do-it-yourselfers can tackle that list of fix-it chores AND pack some heat! 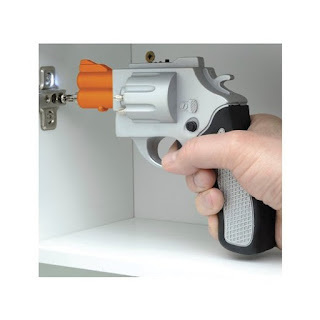 Rechargeable screwdriver looks just like a snub-nose revolver. BONUS QUESTION! Who has the best price? Today it is definitely the UK Amazon site!